As the first quarter of the year continues to accelerate, we find that many business owners, executives, and practice managers begin to refocus their efforts on business development and marketing. And, when refocusing, savvy management tends to identifies low hanging fruits from which to gain early wins and a strong start. Here are three of these low hanging fruits which can act as levers of effective growth for your company. Proximity: How close is your business to the person searching. Reviews: How many do you have and what’s the average rating (more on this below). Authority: How many places is your business listed (or cited) across the internet. Now, 90% of companies cover the basics; listing their businesses on Facebook, Google, Yelp, etc. However, that’s not enough if you want to be consistently bringing in new business from local Google searches. In the Physical Therapy industry specifically, there are 44 top sites your business should be listed on and over 100 more that are not as important but do help to boost your rank. Listing your business on these sites is as simple as creating an account and filling out your business profile. Citation errors can be a big problem too. If your business has an address of 123 main street on Facebook, but has 456 main street listed on Yelp — Google will get confused and doc points from your authority score. To find out what sites your business is listed on and what sites it isn’t as well as any citation errors you may have, you can CLICK HERE to get all of our best citation resources. Consumer studies have been diving deep into the behaviors of patients as they’ve become less “accepting buyers” of clinical services and products — but, rather… they are now sophisticated healthcare consumers. 77% of patients use online reviews as their first step in choosing a new provider. 84% of consumers trust online reviews as being reliable and genuine. 91% will read them, regardless of their feelings about online reviews. 50% of general online users searching a medical condition are also searching for a specific provider. Beyond that, payers are also asking about internal reviews — a truly unexpected data set; a metric they are beginning to take interest in. The fact is this: There are many combinations and permutations of purchasing behaviors that healthcare consumers are using to make their shopping decisions. However, one consistent thing is — they WILL check your reviews and they WILL be looking at your website as well as…. your social media channels. Nearly 80% of healthcare consumers state that a health provider’s trustworthiness is the most important & desired trait. For which, 68% of consumers state they would be willing to travel further for a better healthcare experience. 41% of consumers admit that social media would affect their choice. 43% of baby boomers are using social media for health information. As much as healthcare consumers trust online reviews to get a sense of the overall experience, they are also using social media to check up on healthcare companies before they truly buy in. Being that Social Media is literally Word of Mouth 2.0 — it is the ideal ecosphere for practices to authentically connect with pre-purchasing customers in channels that can lead to direct communication and conversation. And, despite some recent times of concern with platforms such as Facebook, the statistics are overwhelming — “With the exception of people over the age of 65, more than half of Americans in every age group say they are on Facebook.” AND, that’s just Facebook… not to mention all the numbers behind Instagram, Twitter, Snapchat, NextDoor, YouTube, etc. etc. etc. 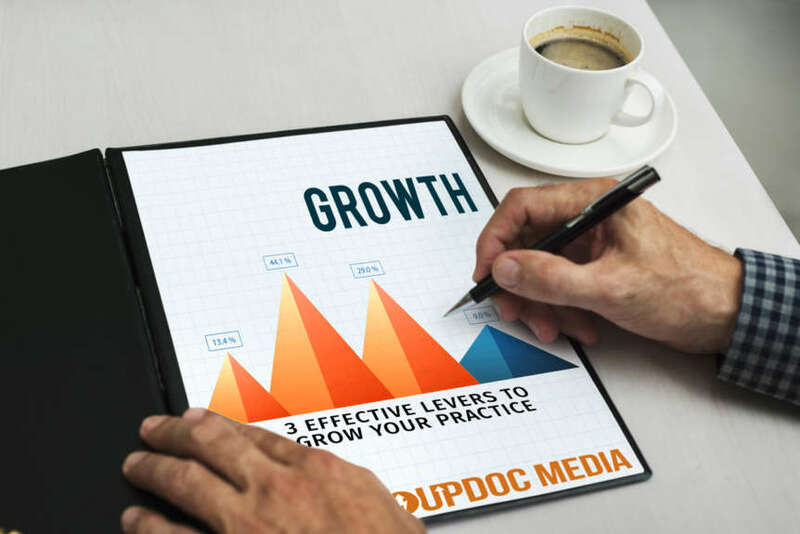 If practices wish to grow, they must connect with the audience where they already are; healthcare companies can quickly and easily do so through strategic use of social media. The beauty of online marketing is that it is quickly and easily scalable. Thanks to technology and the ultimate playing field leveler in “the digital footprint” (websites, reviews, citations, and social media) — these become a crucial part in creating the strongest reach in scaling your brand’s message to the right audience, for the right action, at the right time. Interested In More Marketing Resources? If you’d like to explore our best emails, templates, ads, and scripts (along with video training on how to use them) to efficiently pull these three levers, we loaded up 500 USBs with our best-of-the-best, battle tested methods — our golden key to what makes UpDoc marketing strategies work so measurably well.